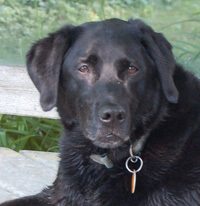 Oreo is a pure bred black Labrador retriever. Known as "The ultimate ball retriever" Oreo usually does nothing but fetch tennis balls and be obnoxious until you throw it so she can fetch it. When she runs out of tennis balls she will get a piece of firewood out of the wood box. And if that fails, she will go fishing in the lake for a rock. Now if only we can teach her to fetch brewskies. 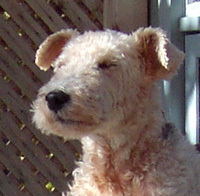 "Blind Melon Perry" is a pure bred wire fox terrier who went blind at an early age due to cataracts. He is still my faithful buddy and is a master at cleanup in the kitchen. He also serves as a coach at nap time. Of course being blind, he consistantly finds the dock too short. "Was that a muskie or Perry?" 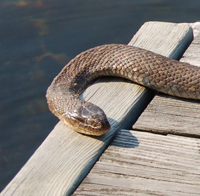 Our sales department prefers to laze around on the dock waiting for the deals to come to them. Mind you closing deals this way means we won't have a pit to hiss in! This would also explain our total lack of advertisers. At least they stay out of the beer fridge. 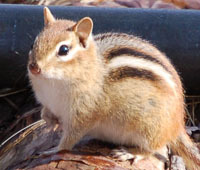 The chipmunk is an ever-present peanut hound. He does a good job of cleanup and yard maintenance as well as some comedy relief. Now we have to teach him how to use the cottage mower. 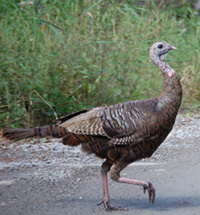 The "Wild Turkey of the Week" is the person, group or organization that has proven themselves worthy of being stuffed, baked, and basted. Similar to the Darwin Awards without the loss of life, this will be awarded to the best example of idiotic loonacy that we can come up with. 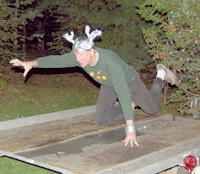 The "Christmas Moose" is a very rare species found around cottage country. This creature is known to rampage through the woods in search of beer. This beast is to be considered dangerous and unpredictable. Be sure to steer clear and avoid antagonizing him at all costs. You should also be carefull not get between him and his beer fridge. It could be to your peril! Our director of communications makes sure everyone is on the same page. He specializes in both audio as well as visual media. 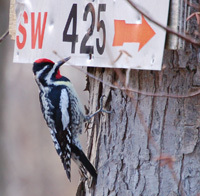 He is obviously handy at nailing signs to trees, but many are not aware that he is equally adept at audio communications. That is as long as you can decipher morse code which he hammers out with his face. An interesting twist on the old jungle drums. 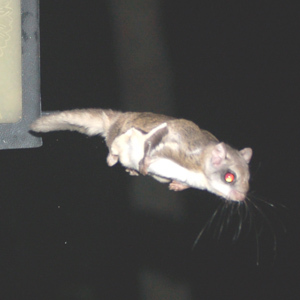 Ricky the flying squirrel is our new hire. As official travel director he obviously prefers air travel but is also quite efficient at ground travel as well. Unfortunately he is continually booking us on the damn red-eye.